Inflammation is the reaction of a part of the body to injury or infection, characterized by swelling, heat, redness, and pain. The process includes increased blood flow with an influx of white blood cells and other chemical substances that facilitate healing. 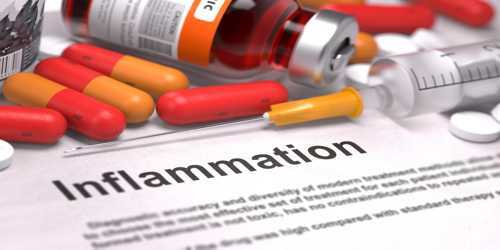 The function of inflammation is to eliminate the initial cause of cell injury, clear out necrotic cells and tissues damaged from the original insult and the inflammatory process, and to initiate tissue repair. The response consists of changes in blood flow, an increase in permeability of blood vessels, and the migration of fluid, proteins, and white blood cells (leukocytes) from the circulation to the site of tissue damage. 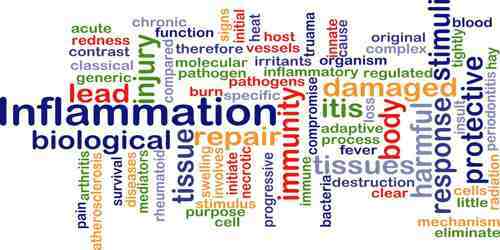 An inflammatory response that lasts only a few days is called acute inflammation, while a response of longer duration is referred to as chronic inflammation. However, in some diseases, like arthritis, the body’s defense system — the immune system — triggers an inflammatory response when there are no foreign invaders to fight off. In these diseases, called autoimmune diseases, the body’s normally protective immune system causes damage to its own tissues. The body responds as if normal tissues are infected or somehow abnormal. The factors that can stimulate inflammation include microorganisms, physical agents, chemicals, inappropriate immunological responses, and tissue death. 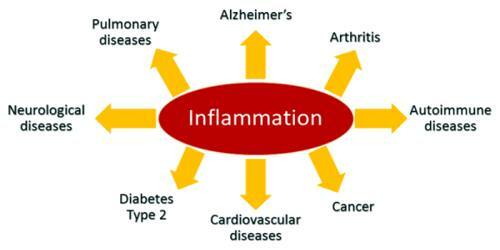 Infectious agents such as viruses and bacteria are some of the most common stimuli of inflammation. Physical trauma, burns, radiation, and frostbite can damage tissues and also bring about inflammation, as can corrosive chemicals such as acids, alkalis, and oxidizing agents. As mentioned above, malfunctioning immunological responses can incite an inappropriate and damaging inflammatory response. Inflammation can also result when tissues die from a lack of oxygen or nutrients, a situation that often is caused by loss of blood flow to the area. A very rare but dangerous complication of an inflammation is called sepsis. Sepsis may occur if bacteria multiply quickly in a certain part of the body and then suddenly enter the bloodstream in large quantities. This can happen if the body does not succeed in fighting the inflammation locally, the pathogens are very aggressive, or the immune system is severely weakened. Chills, feeling very ill and very high fever can also be signs of blood poisoning. If blood poisoning is suspected, medical assistance is urgently needed. There are a number of treatment options for inflammatory diseases, like arthritis, including medications, rest, exercise, and surgery to correct joint damage. The type of treatment prescribed will depend on several factors, including the type of disease, the person’s age, type of medications he or she is taking, overall health, medical history, and severity of symptoms. Inflammation on the other hand describes purely the body’s immunovascular response, whatever the cause may be. But because of how often the two are correlated, words ending in the suffix -itis are sometimes informally described as referring to infection.